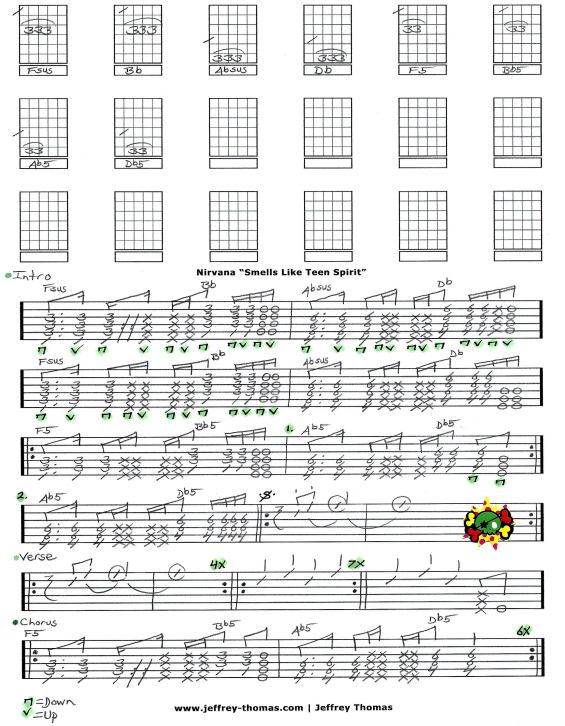 Nirvana Smells Like Teen Spirit Free Guitar Tab by Jeffrey Thomas. Here it is, the “Grunge Anthem” arranged nice and neat in my custom guitar tab. Play the right chords, song structure, solo combining the multiple guitar tracks into one solid version. I followed the official video version which cuts down the running time compared to the studio tracks. Want the full guitar tab for free? Go ahead and send me your email address through the form provided. Fill out and send the Schedule A Free Lesson form to set up your free Skype guitar lesson today! “Smells Like Teen Spirit” was Nirvana’s biggest hit reaching number 6 on Billboard’s Hot 100. Find more popular online guitar tabs on my tab, video and blog pages.